Many precious analysts stop their analysis at gold's US dollar analysis alone. Sometimes they add silver or – at most – mining stocks to the picture. But the focus on key ratios and on gold's performance in terms of other currencies is rare. Silver's non-USD performance is almost never discussed. And it's a shame, because that's where the current weekly extreme can be found. The above chart shows the silver to UDN ratio chart, which is a proxy for silver's price in terms of currencies other than the US dollar. The UDN ETN is an inverse vehicle that's based on the USD Index. In order to check how silver would be doing without USD's influence, we need to take the latter "out" of the silver price. If the USD was moving in the same direction as silver, we would simply divide silver's price by the USD Index and we would get the desired values. But, since USD and precious metals move in opposite ways, we need to do the opposite – we will first inverse the USDX so that it moves – on average - in the same direction as the PMs, and then we will divide silver by it. The UDN ETF is an inverse USDX instrument, so it does exactly the above. The silver to UDN ratio is effectively very close to an indicator of silver strength on its own. What is so special about the above non-USD silver chart? One thing is that it allows for technical analysis that could point to some developments earlier than in case of the regular USD perspective. That's not the main point here, though. Besides, using ETNs that have sizable time decay can make their technical analysis considerably less effective than the analysis of the underlying, unleveraged instrument (that's why it's a mistake to focus on price formations in leveraged ETNs such as NUGT and DUST). Why should you care? Because in 6 out of 7 cases where we saw these huge volume spikes silver plunged either sooner or later. 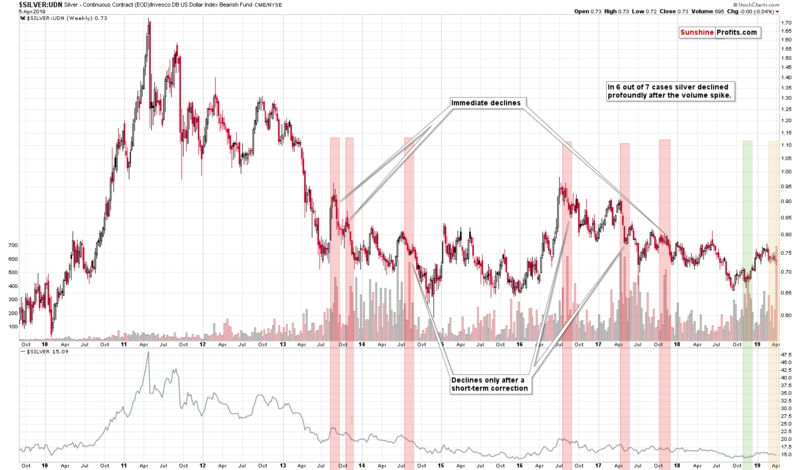 That's the key implication – the silver picture remains strongly bearish for the medium term. This is in perfect tune with last week's bullish reversal in gold, silver, and – especially – mining stocks. This is also in perfect tune with what we have identified as an important, yet little known, extreme sign from the silver sector. Silver's non-USD chart is not the only silver place where we saw record-setting volume spike. Silver stocks provided the heads-up even earlier. 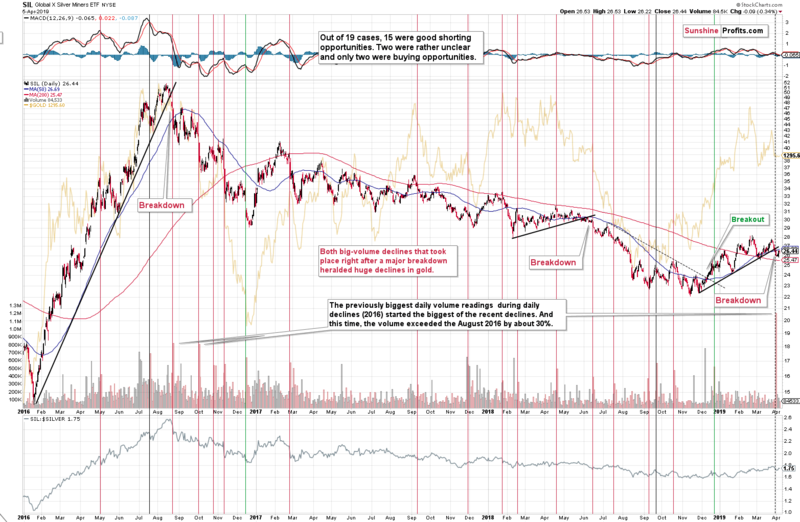 Gold price usually moves in tune with the silver price, and silver stocks usually move in tune with silver. The sizes of the moves are not identical, but the turnarounds often take place at the same time. The price moves are similar enough to say that the big moves will take place at the same time, but they are different enough for the markets to provide different signals. At times, one market might lead the other. There may also be other specific features and in today's Alert, we'll focus on one of them. Namely, we're going to discuss the huge daily volume spikes. And in particular, we're going to focus on days when the silver miners (we're using the SIL ETF as a proxy for the sector) declined on big volume. There were quite a few such days since early 2016 and they were almost all characterized by analogous price action - not only in the case of silver miners, but also in the case of gold. The above doesn't reveal the efficiency, nor the severity of the signal, though. The professional approach is to focus on the losses or things that invalidate a given theory first, and that's exactly what we're going to do now. Let's start with the two cases that were actually buying opportunities. In the opening paragraph, we have mentioned that these two cases are not similar to the current situation. Both cases took place in December and we're far from this month, but that's not the main point. 1. The daily volume early last week was higher than what we have seen previously. In fact, it was highest daily volume that we ever saw in case of the SIL ETF. 2. The volume spike took place right after a major breakdown. April 1 volume in the silver miners was no April Fools' Day joke. It exceeded the previous record by about 30%. Out of the recent years, we saw the biggest daily volume during a decline in silver in 2016: in August and September. That was the beginning of the biggest decline in gold of the recent years. In other words, the only analogy that we have based on the size of the volume points to the biggest decline in the recent history. And the volume was even bigger this time – it broke the previous record. Will the decline be bigger than the late- 2016 one? That's what is very likely based on many other techniques and what the above silver chart is confirming. Both the above-mentioned factors suggest that 84.2% efficiency is likely understated and should in reality be higher. In particular, both links point to analogy between the current situation and what we saw in August 2016. It then took gold less than 4 months to decline over $200. And let's keep in mind that the volume was much higher this time, so the move – based on the above chart alone – could also be bigger this time. 1. Silver miners broke below their rising black support line and the recent upswing serves as a verification of the breakdown – it's not bullish, it's a natural part of a bigger, bearish move. 2. The silver miners' chart shows that the December 2018 case is not as the current situation, and in case of the silver's non-USD chart, the only case when the white metal didn't decline in tune with the other cases was in late November 2018 – very close to the above-mentioned case. The only case that invalidates the analogy seems to be less relevant than other cases, which increases the reliability of the silver's non-USD volume spike signal and its bearish implications for the medium term.